Repo auctions are how lenders typically re-market and liquidate their repossessed collateral. Most understand the glut of homes lenders are stuck with. Just recently I had a Suntrust loan negotiator confide in me that they are receiving 500 new pre-foreclosure files....a day! However, the tidal wave of "non-performing assets" lenders are having to liquidate is not restricted to homes and vehicles. Boats and recreational collateral are also becoming an epidemic. The big ticket toys financed in 2012-2015 are now being liquidated at repo auctions on behalf of lenders such as Citi Bank, Wachovia, Suntrust, etc. all across the country. Problem is many of these auction houses can't liquidate them fast enough forcing lenders to concede on their asking price. For example even though repo boats are liquidated by banks via. repo auctions, dealerships, used car lots, and even bank or credit union parking lots, lenders still only expect a fraction of what’s owed..
Cathy Tierney, president of Community First Credit Union states, "When selling a repossessed boat, lenders are fortunate if they get 75% of the amount owed." Mark Gaska, partner at M-W Marine boat dealership in Wisconsin states: "Usually these boats are 1 to 3 years old, and the owners hadn't made that many payments before they realized what the heck they got talked into," Gaska said. As banks continue to inventory repos they have been forced to re-evaluate not only how to re-market their collateral but at what price point as well. 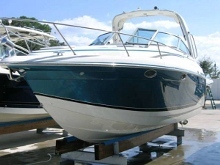 BoatAuctionsDirect.com is a new website this year that regularly aggregates and categorizes seized and repo auctions by state. The site specifically lists sources across the country including Canada that liquidate siezed or repossesed boats, yachts, pwc's, rv's, atv's, motorcycles, and marine equipment. Repo auctions are held by auction houses on behalf of banks and credit unions, Government agencies, desperate owners, bankruptcy and dealer liquidation sales. A very deep resource that over delivers considering the price. MrRepo.com is based out of Ocoee, FL and specializes in liquidating repossessed cars and suv's with a few cycles and choppers as well. Auctions are held on behalf of lenders like: GMAC, Wells Fargo, Capital One, Bank of America, Chase, Wachovia bank, etc. Most repo men are busy mid to late season. The best time to start looking for deals at boat repossession auctions is during the first several months of the year and then after boating season. There’s typically a spike in repos in January but it takes a few months before they finally show up at a local auction. Click here to find out more about repo boats.